New State Superintendent Carolyn Stanford Taylor visiting students at Mendota Elementary School in Madison. Reporter Emily Files speaks with new DPI Superintendent Carolyn Stanford Taylor on Lake Effect. Carolyn Stanford Taylor is Wisconsin’s first African-American superintendent of schools. She was appointed last week by Gov. Tony Evers to take over his former job leading the Department of Public Instruction (DPI). Stanford Taylor has firsthand experience with America’s deep-seated education inequities. As a 9-year-old, she was one the first black students to integrate schools in her hometown of Marks, Miss. She says her mom posed the question to her and her siblings one day on the walk to school: do you want to go to the black school or the white school? Stanford Taylor says she and her siblings never got to swim in the white school’s pool. It was filled in with cement. “We were in a place where we were not wanted,” she said. But even though the school environment was not supportive, Stanford Taylor says her mother was the advocate she needed to be a successful student. After graduating high school, Stanford Taylor started college at a nearby Mississippi school. But her brother, a student at UW-Madison, convinced her to come to Wisconsin. Stanford Taylor received her bachelor’s and master’s from UW-Madison. She was a teacher and principal in the Madison school district before joining the staff at DPI in 2001. 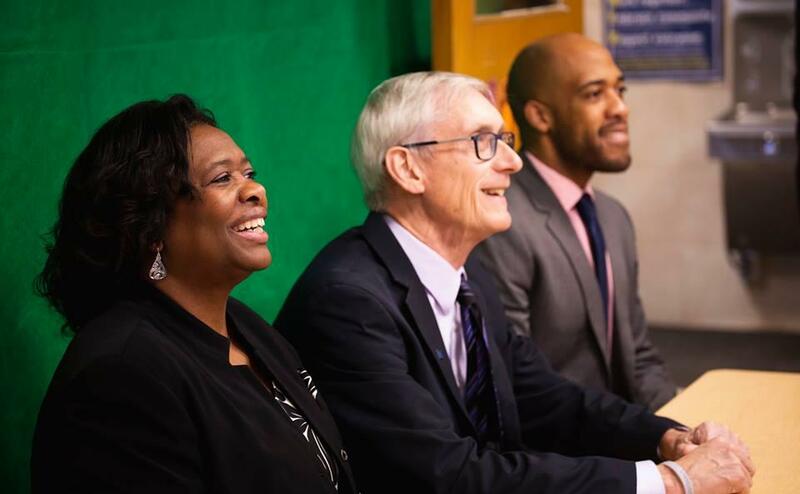 Now, as the leader of the state's education agency, Stanford Taylor says she wants to advance DPI’s "equity agenda," to close racial and economic achievement gaps, which are particularly wide in Wisconsin. Stanford Taylor says she will push for more state funding of early childhood education as one strategy to tackle achievement gaps. New DPI Superintendent Carolyn Stanford Taylor with Gov. Tony Evers and Lt. Gov. Mandela Barnes during a visit to Mendota Elementary School in Madison. Last fall as head of DPI, Tony Evers called for a $1.4 billion increase to education spending. Now, Evers is governor, and he'll have to work with the Republican-controlled legislature on the budget. Stanford Taylor says if she had to choose one education funding issue for the legislature to tackle, it would be special education, which she says has been underfunded for a long time. Right now, the state reimburses only about a quarter of school districts’ special education costs. Evers’ DPI budget recommends increasing the reimbursement rate to 60 percent. Stanford Taylor will oversee DPI until at least 2021, when her appointed term expires. She hasn’t ruled out running for election at that time. Have a question about education you'd like WUWM's Emily Files to dig into? Submit it below. At Tony Evers’ inauguration last week, he repeated one of his central promises: that he would invest more in public education. State education chief and gubernatorial hopeful Tony Evers wants to put an additional $1.4 billion into public education over the next two years. The proposal is part of the Department of Public Instruction’s request for the 2019-2021 state budget. Evers, a Democrat, heads the agency as state superintendent. The spending plan comes in the middle of a tight race between Evers and incumbent Gov. Scott Walker, a Republican. There could be major funding changes on the way for Wisconsin public schools. A lawmaker-led committee on education spending met for the final time Wednesday. It put forward a list of recommendations for legislative action. The Blue Ribbon Commission on School Funding traveled around Wisconsin in 2018. It took testimony from administrators, teachers, parents and students. The consensus: an overhaul of Wisconsin’s education funding system is overdue. New Wisconsin standardized test results for the 2017-18 school year were released this week. Statewide, there aren’t any dramatic changes from the last two years: Students’ math scores are inching up and reading scores have fallen slightly. But the results are a reminder that just one in five Milwaukee students is proficient in reading and writing. And even fewer meet standards in math.